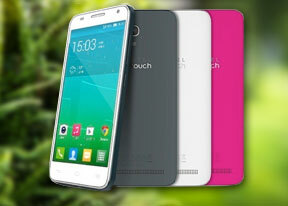 The Alcatel One Touch Idol 2 Mini is aimed at those who find the Idol 2 too big for comfort. It's built around a 4.5" IPS LCD display of qHD resolution, resulting in 245ppi. It is what it sounds - an affordable midrange offering. Although the display obviously lacks the crispness 720p resolution would've given it, the viewing experience is pleasant. Colors are great and viewings angles excellent, and the contrast isn't too far behind. The Alcatel Idol 2 Mini is made of plastic, but just like the Idol 2, it's matte and exudes premium look without the hefty price tag. In fact, it weighs just 110 grams and measures 7.9mm thick. The phone features an 8MP camera at the back and a 2MP camera at the front. The main unit shoots 1080p video easily thanks to the quad-core 1.2GHz CPU and 1GB of RAM. The inbuilt storage is just 4GB for the single SIM version, but is expandable via the microSD card slot. The dual SIM version features 8GB of storage, but no microSD card slot. The phone runs Android 4.3 Jelly Bean and, just like the Idol 2, will receive KitKat down the road. Its connectivity suite is very well thought out with Bluetooth 4.0, dual-band Wi-Fi and NFC. Alcatel says the Idol 2 Mini will launch next month at €169.